The oldest parts of this inn date from the 16th century, when a farmhouse called Glasdraean stood here. It was also known as Tŷ Uchaf (“Upper House”), the village’s other farmhouse – now a National Trust shop – being Ty Isaf (“Lower House”). The farmhouse doubled up as an inn by the 1790s, and may have been licensed to serve alcohol as early as the 1650s. It was known as the Saracen’s Head by the 1820s. Before King Henry VIII ordered the dissolution of monasteries in 1536, the farm belonged to Aberconwy Abbey, in the Conwy Valley. Later it was part of one of North Wales’ largest estates, that of the Bulkeley family of Baron Hill, Beaumaris. 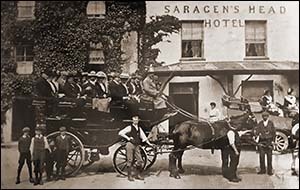 From the early 19th century, the Saracen’s Head benefited from Beddgelert’s tourist trade. The old farmhouse was rebuilt in the early 1870s, with some of the earlier panel walls retained. The hotel was electrified in 1914, seven years before it was sold by the Bulkeley Estate. In 1877 a police constable noticed an unattended cart in the hotel’s yard and soon established that it was full of dynamite. There was nothing written on the cart to warn of the explosive cargo beneath its tarpaulin. Dynamite carrier Isaac Jones said he’d left Llanberis at 3pm and had stopped in Beddgelert because his horse needed a rest before continuing the journey to Ffestiniog. He was fined 50 shillings (about £130 in today’s money). The Saracen’s Head was taken over in 2013 by Michelle and David Cattrall.